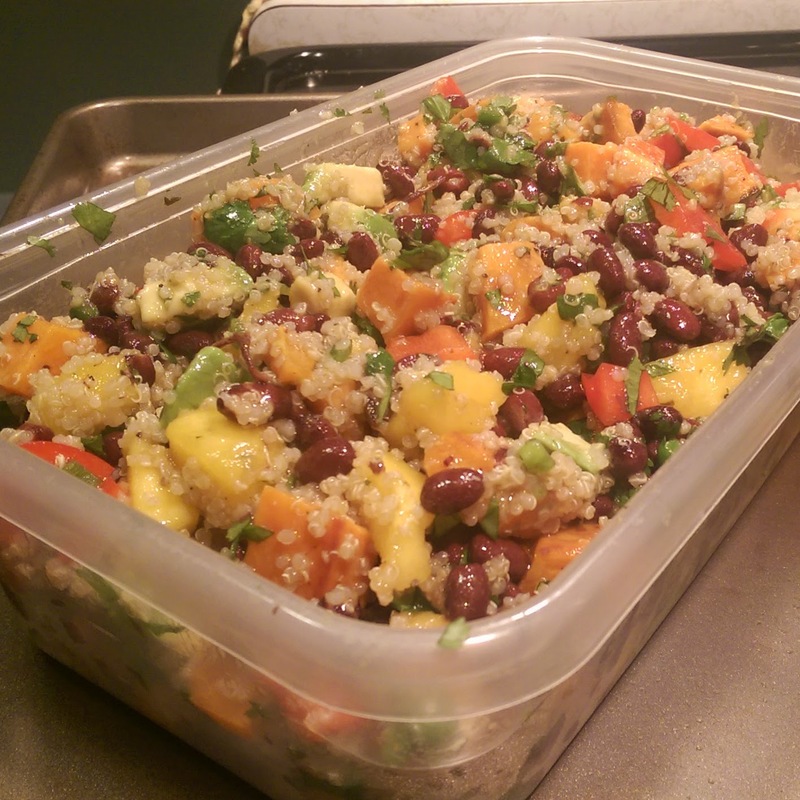 I had about 4 cups of cooked black beans from my Cuban Pork recipe I needed to use up, so I turned to this delicious quinoa salad that was hearty, fresh, and held up well over a 5-day work week. The recipe did take about an hour to cut up all the different produce, but if you have the time on Sunday, it’s worth the effort saved throughout the week I’ve adjusted the original recipe, found on PBS’ Kitchen Vignettes, by adding my step to roast the sweet potato and knocking the dressing’s oil down to a more healthy 1/3 cup. Preheat oven to 400. Drizzle olive oil on top of cubed sweet potato, and roast for 15-20 minutes. Rinse your quinoa through running water and drain well. Bring 3/4 cup water to boil, then add in the quinoa and cover, reducing the heat to low. Simmer for 8 minutes, or until most of the water is absorbed. Remove from heat, keeping the lid on, and let rest for an additional 15 minutes. While the quinoa cools, begin chopping your produce and adding to a large bowl (black beans through black pepper). When the quinoa is at room temperature, add it to the bowl. Mix the lime juice, honey, cumin and garlic together in a small bowl. Slowly whisk in oil until emulsified. Pour over salad and toss everything together GENTLY so not to mash up the avocado and black beans.